Previously you’ve learned 54 High Frequency Words from the Quran, yesterday’s HFW being (سَبِيْل) . The HFW you will learn today is repeated for 184 times in the Quran. As of today you’ve learned 55 words from the Quran. Collectively these words are being used for 6328 times in the Quran! MasyaAllah! Let’s continue reading! 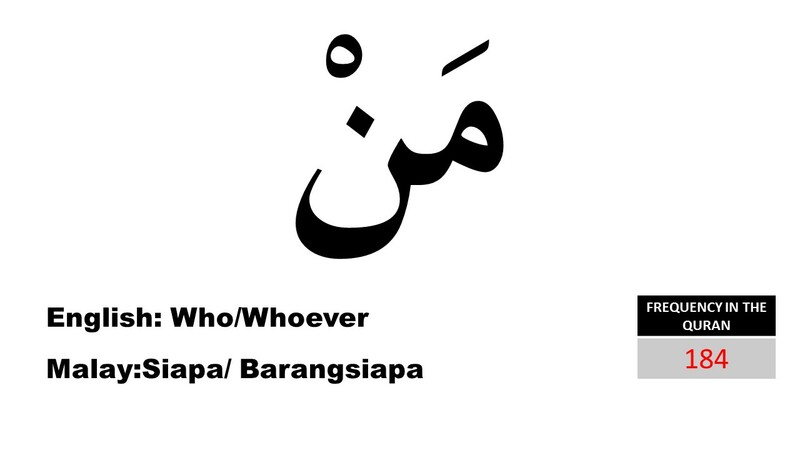 Today’s HFW is (ْمَن) which means “WHO” or “WHOEVER”. We use this word to learn the identity of a person or even our own identity. Living in this world most of the time we put more attention on our national or corporate identity and less focus on spiritual identity. Spiritual Identity is very essential in developing our Spiritual Maturity and growing our Imaan. We define our spiritual identity by our akhlaq, our moral values, our ethics, and our religious practices, and how we react to others. It also influence our worldview and how we view our future, our past and present. All these need knowledge from sunnah of Rasulullah s.a.w. and guidance from Allah s.w.t. and blessed are those who Allah bestowed with knowledge from both. Even for our own Identity we need guidance from Allah s.w.t. and HE already provided it with through the Quran. When we read and follow the guidance from the Quran we are allowing our spirit to develop to its true nature, so let’s put aside some time to read the Quran daily and develop our Spiritual Identity.